Knuckles in Sonic 2 prototype 0610 for the Sega Mega Drive was released by drx during the February 23rd, 2008 proto release. This prototype, along with every available build after the 0524 prototype, is a dump of the Sonic & Knuckles UPMEM chip. 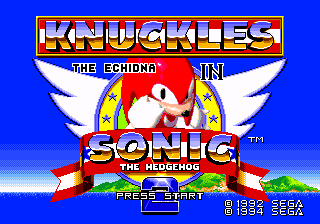 In order for this build to be playable, it must be attached to the beginning of a Sonic 2 ROM. Merging these two ROMs emulates the use of Lock-On Technology. The Knuckles in Sonic 2 0524 prototype is the only prototype released as a working stand-alone build. Level Select is not enabled by default. The cheat code is the same as the final version. This page was last edited on 27 September 2018, at 08:26.